While Apple Pay will work in any store that accepts contactless payments, Apple has partnered up with several retailers for the launch of Apple Pay, to ensure the mobile payment service will work smoothly in those locations. In retail stores, only iPhone 6 and 6 Plus users can take advantage of Apple Pay, as payments require NFC. 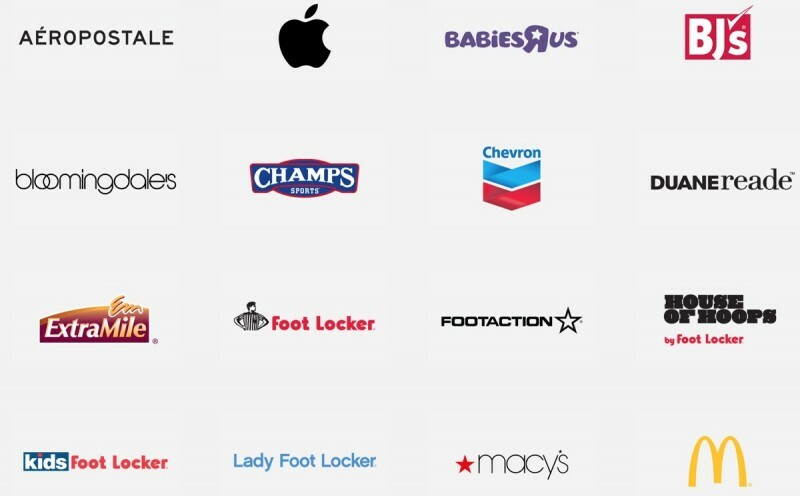 Retail partners that will begin accepting Apple Pay payments today or in the immediate future include Aeropostale, Babies R Us, BJ's Wholesale Club, Bloomingdales, Champs, Chevron, DuaneReade, Foot Locker (including Lady Footlocker, Run by Footlocker, Kids Footlocker, and House of Hoops), FootAction, Macy's Nike, Office Depot, Petco (and Unleashed), Radioshack, Six:02, Sports Authority, Texaco, Toys R Us, Walgreens, and of course, Apple's own retail stores. Fast food locations now accepting Apple Pay include McDonald's, Subway, and Panera Bread, while grocery stores accepting the payments service include Wegmans and Whole Foods Market. Apple Pay can also be used within apps on devices that support Touch ID, which includes the iPhone 6, the iPhone 6 Plus, and Apple's upcoming iPad mini 3 and iPad Air 2. Apple's iPhone 5s does not appear to be compatible according to the Apple Pay website, even though it has Touch ID. Over the weekend, Apple's iTunes chief Eddy Cue said that he expects most initial Apple Pay transactions to take place within apps. Apple's app launch partners, which will begin accepting Apple Pay payments through app updates going out today, include AirBnB, Chairish, Disney Store, Fancy, Groupon, Hotel Tonight, Houzz, Instacart, Lyft, MLB.com, OpenTable, Panera Bread, Spring, Staples, Target, Tickets.com, and Uber. Apple's own Apple Store app now accepts Apple Pay payments as well. Apple Pay updates for the above listed apps should be trickling out beginning today now that Apple Pay is live. Bank apps are also being updated with Apple Pay support, and Capital One and Navy Federal Credit Union have already launched apps with Apple Pay updates. Largest distributor of babies in the U.S.
EDIT: Ok maybe you aren't familiar with NFC, or contactless payments. Look for a sideways wifi logo at a credit card terminal. This is not the full list. They are more common than you think. In another thread, someone already bought a soda from a soda machine that accepts NFC payments. I live in Europe and this interests me as a person interested in technology. I'm not sure what's more pathetic: that you have an account at MacRumors to talk trash or that your grammar and punctuation are that abysmal. Sheep is already plural. It would be "iSheep." Apple Pay can also be used within apps on devices that support Touch ID, which includes the iPhone 6, the iPhone 6 Plus, and Apple's upcoming iPad mini 3 and iPad Air 2. Apple's iPhone 5s does not appear to be compatible according to the Apple Pay website, even though it has Touch ID. Wow, this particular example of Apple artificially making hardware obsolete is pretty bad. Worse than Mac Mini 2011 and MacBook Air 2011 owners not being able to use Handoff, despite having the correct and necessary Bluetooth 4.0 hardware. With Apple Pay, instead of using your actual credit and debit card numbers when you add your card, a unique Device Account Number is assigned, encrypted, and securely stored in the Secure Element, a dedicated chip in iPhone, iPad, and Apple Watch. Wouldn't a lot of guys want to go there?